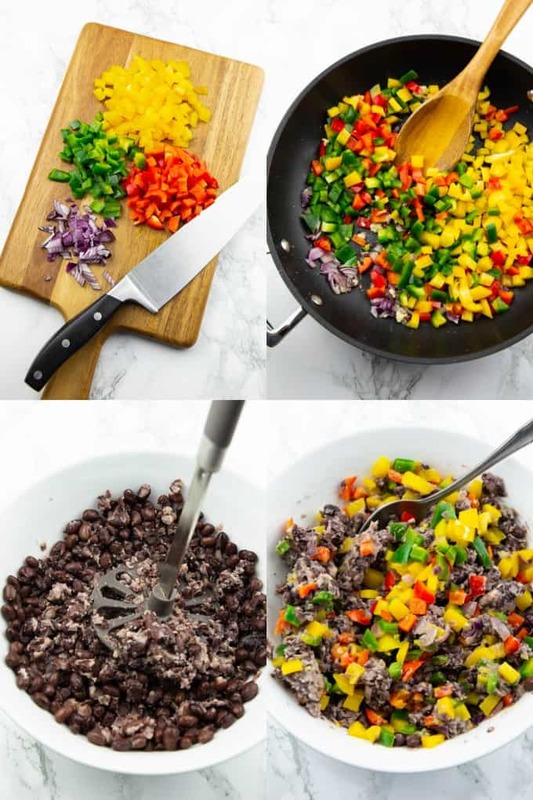 These vegan enchiladas with black beans and bell peppers are super delicious and satisfying! And they are really easy to make, so they make a great weeknight dinner for the whole family! Oh, how I love Mexican food! 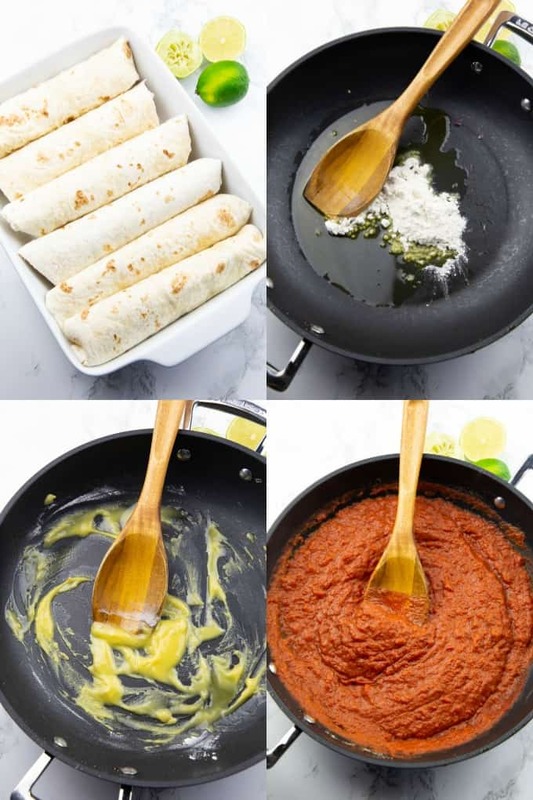 Last spring, I posted a recipe for vegan taquitos with chipotle sauce, which you guys totally loved. 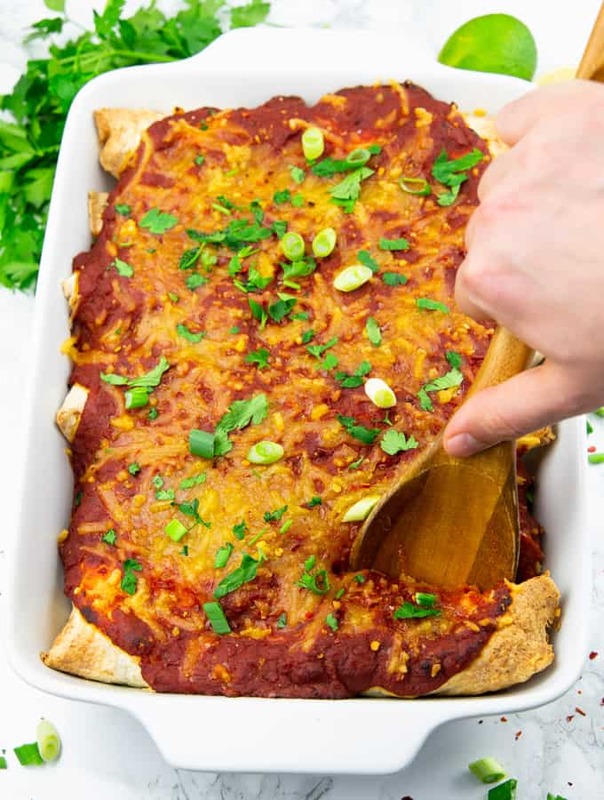 So this year we needed another Mexican classic on the blog: Vegan enchiladas! They’re sooo yummy! You don’t need any fancy or hard to find ingredients for this recipe. You should be able to find all of the ingredients in most grocery stores. The only exception might be the vegan shredded cheese. But these days you can find it in most supermarkets. If not check out your local health food store. 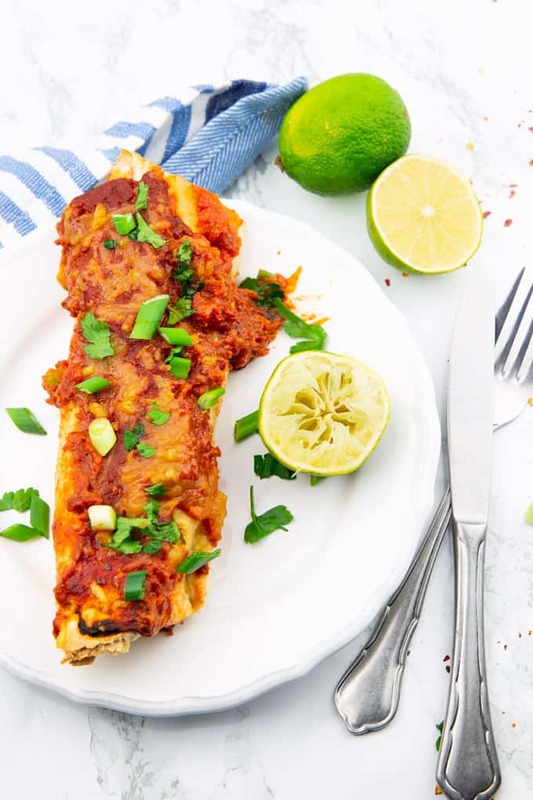 The recipe for these vegan enchiladas couldn’t be much easier. All in all, it’s ready in about 40 minutes, which makes it a great weeknight dinner. 1. STEP: Finely chop the onion and cut the bell peppers into small pieces. 2. STEP: Heat some oil in a large pan and sauté the onion and the garlic for about 2-3 minutes. Then add the bell pepper and cook for another 4 minutes. 3. STEP: Drain and rinse the canned black beans or use home-cooked beans. Place them in a large bowl and mash them with a potato masher. Leave some beans intact for texture. 4. STEP: Add the onion, garlic, and bell pepper mixture to the mashed beans. Season with cumin, smoked paprika powder, lime juice, salt, and pepper. 5. 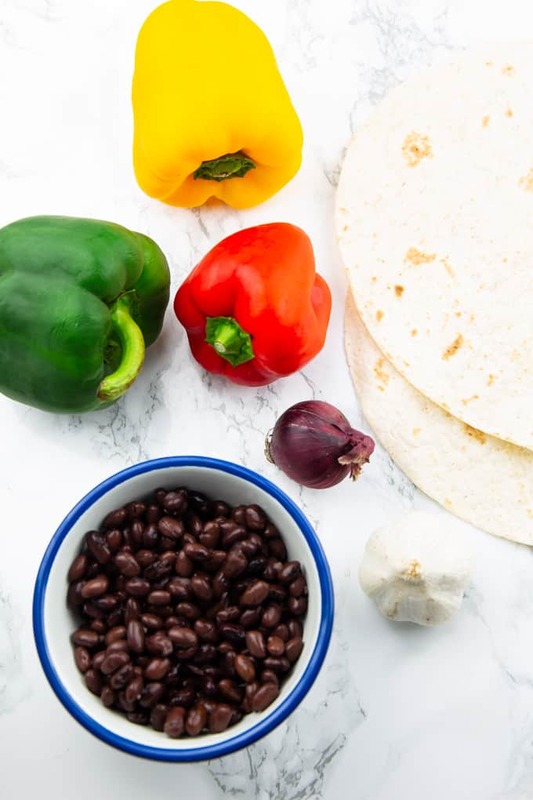 STEP: Fill the tortillas with the bean bell pepper mixture and roll them up. 6. STEP: Lightly spray a baking dish with non-stick spray. Place the enchiladas seam side down in the baking dish. Preheat your oven to 350 °F. 7. STEP: Make the vegan enchilada sauce. Heat two tablespoons of oil in a large pan. Then add two tablespoons of flour and cook for about 2 minutes. Stir constantly and be careful not to burn it. Then add the crushed tomatoes and the spices. Cook for 5 minutes. 8. STEP: Pour the enchilada sauce over the enchiladas. 9. STEP: Sprinkle with vegan cheese. 10. STEP: Bake the enchiladas at 350 °F for 25 minutes. Sprinkle with chopped cilantro and green onions. If you don’t like fresh cilantro, you can replace it with parsley. Serve immediately. When you mash the black beans, it’s important to leave some of the beans intact for texture. 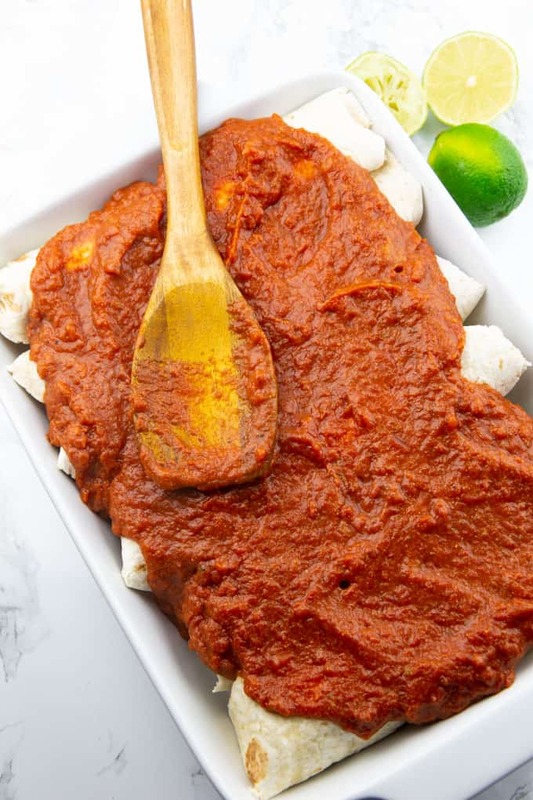 For a gluten-free version, make sure to use corn tortillas and a vegan flour blend instead of all-purpose flour for the enchilada sauce. I used six rather large tortillas, but of course you could also use a larger amount of smaller ones. 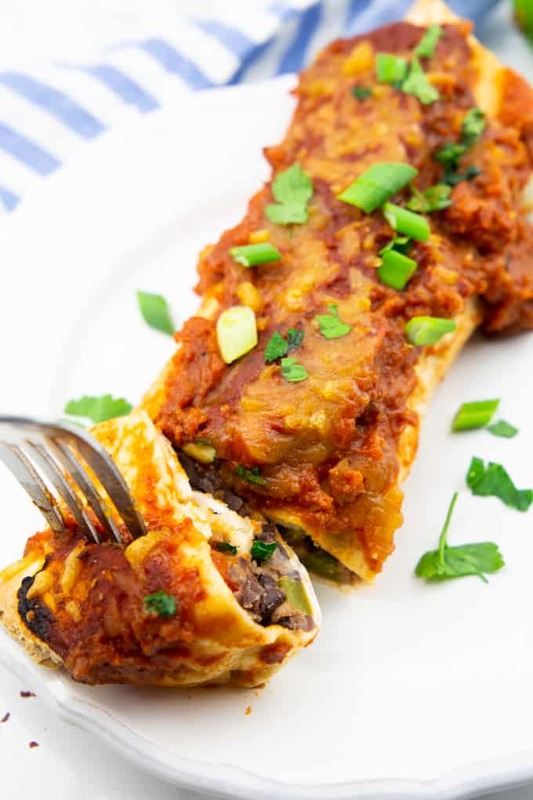 You can easily make these enchiladas ahead. Just cover them with plastic wrap and store the baking dish in the fridge for up to 24 hours. The enchiladas freeze really well. You can either freeze them baked or unbaked. To freeze, just cover the baking dish tightly with plastic wrap and then with aluminium foil. You can freeze them for up to 3 months. 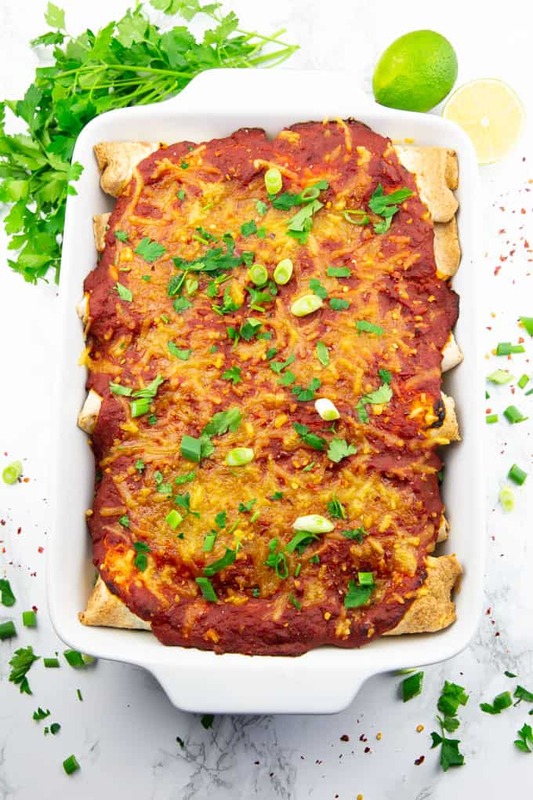 Can You Freeze These Vegan Enchiladas? Yes, enchiladas freeze really well. You have two options: You can freeze the enchiladas before or after baking. However, I recommend freezing the enchiladas without any vegan cheese on top. Just add it later when you bake it after freezing. I think enchiladas freeze better if you bake them first. But both options work. You can freeze them for up to 3 months. 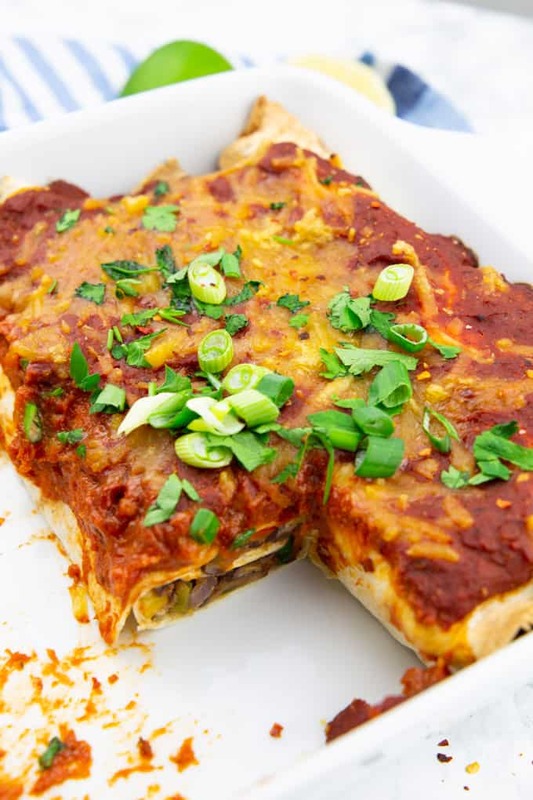 To freeze, cover the enchiladas in the baking dish tightly with plastic wrap and then with aluminium foil. To bake, remove the plastic foil, cover with aluminum foil and bake for 30 minutes at 350 °F. 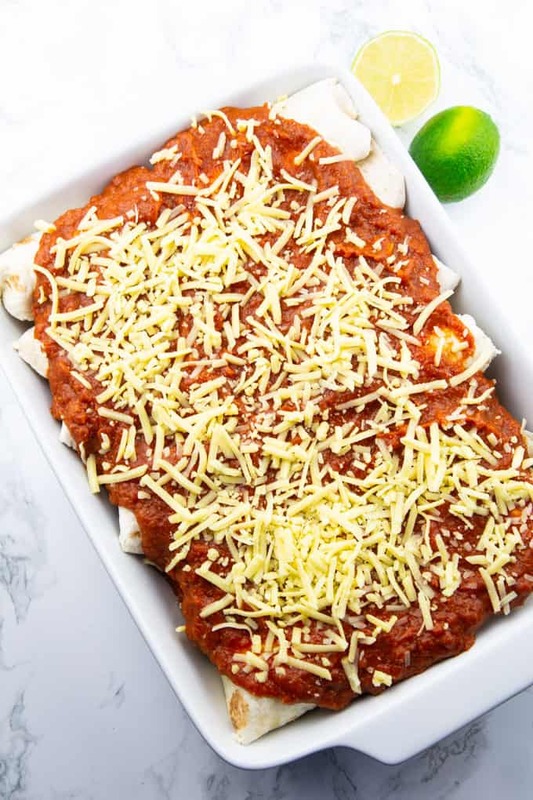 Julie from Savvy Eats wrote a detailed article about how to freeze enchiladas if you’re looking for even more information. Can These Enchiladas Be Made Ahead of Time? Yes, you can easily make these enchiladas ahead. Just cover them with plastic wrap and store the baking dish in the fridge for up to 24 hours. To bake, remove the plastic wrap and bake it for 25 minutes. 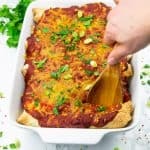 I hope you like this vegan enchilada casserole as much as we do around here. Finely chop the onion and cut the bell peppers into small pieces. Heat some oil in a large pan and sauté the onion and the garlic for about 2-3 minutes. Then add the bell pepper and cook for another 4 minutes. Drain and rinse the canned black beans or use home-cooked beans. Place them in a large bowl and mash them with a potato masher. Leave some beans intact for texture. Add the onion, garlic, and bell pepper mixture to the mashed beans. Season with cumin, smoked paprika powder, lime juice, salt, and pepper. 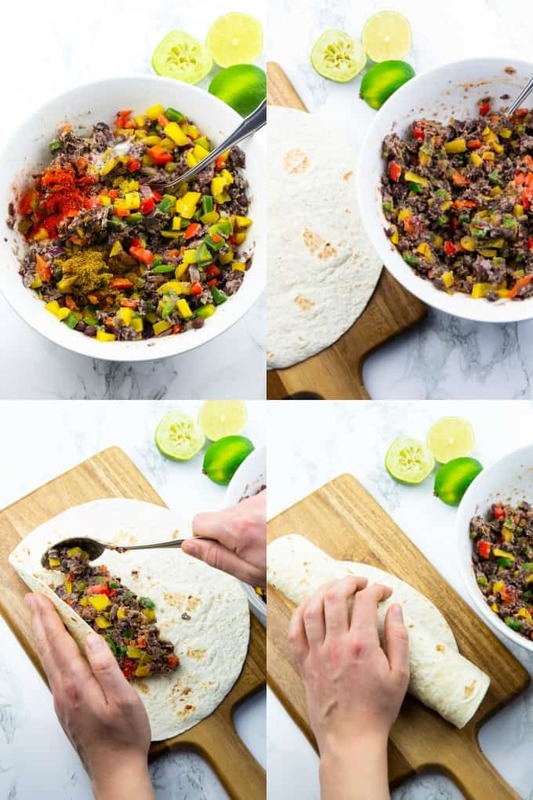 Fill the tortillas with the bean bell pepper mixture and roll them up. Lightly spray a baking dish with non-stick spray. Place the enchiladas seam side down in the baking dish. Preheat your oven to 350 °F. Now make the vegan enchilada sauce. Heat two tablespoons of oil in a large pan. Then add two tablespoons of flour and cook for about 2 minutes. Stir constantly and be careful not to burn it. Then add the crushed tomatoes and the spices. Cook for 5 minutes. Pour the enchilada sauce over the enchiladas and spread evenly. Bake the enchiladas at 350 °F for 25 minutes. Sprinkle with chopped cilantro and green onions. If you don't like fresh cilantro, you can replace it with parsley. Serve immediately. When you mash the black beans, it's important to leave some of the beans intact for texture. 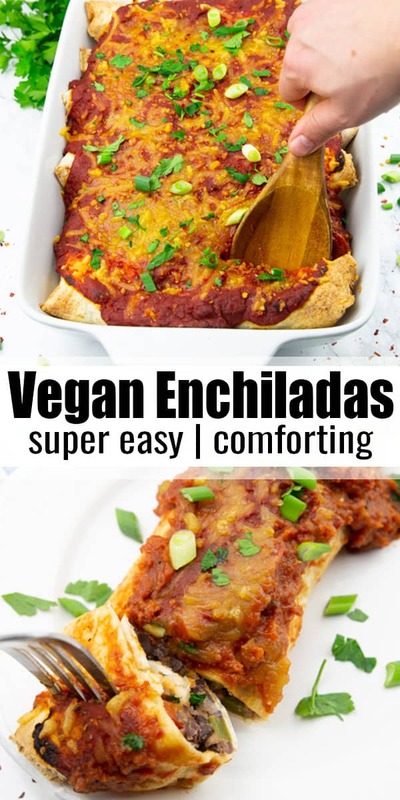 OMG, these vegan enchiladas were sooooo good!! 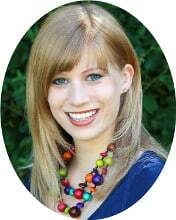 I followed the recipe to a t and my husband and I both loved them. Thanks, Sina!